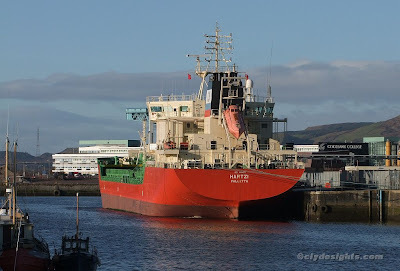 The Maltese-registered tanker HARTZI was seen in Rothesay Dock at Clydebank, having arrived in Brodick Bay on Sunday 7th, and moved upriver late in the afternnoon on Tuesday. Carrying a cargo of petroleum grades from Rotterdam, HARTZI is no stranger to the river, although this is her first visit since she was renamed. Seen on the Clyde in her former guise as ILANDAG in November 2007, she was renamed last December but appears to have remained on time charter to Lukoil.